Does anyone know where Colorado is? It was 2010 and I sat at a large table of dinner guests at a Bed & Breakfast in the small town of Guchan, in the French Pyrenees. The hostess asked her guests this question, speaking in both French and English, "Does anyone know where Colorado is?" A gracious gesture to include me in the dinnertime conversation as the only American and English speaking guest at the table, I thought, finally we get to talk about me. Not one of the guests, both French and German, knew where Colorado was located? Are you kidding me? Colorado! You know John Denver, cowboys and indians, great skiing, the Denver Broncos! The Rocky Mountains! Anyone heard of Austria? I smiled graciously as we changed the subject, back to something in French, as I recall. When traveling in France I often answer questions about the state where I reside. I explain the temperatures and plants in Colorado are very similar to the Midi-Pyrenees. The population of the city of Denver is 620,000 people. The population of Colorado is over 5 million. These numbers are staggering to a local French person living in the Pyrenees where many have never left the valley they were born into. Or to those persons who have fled an exhaustive life in Paris (a city of 2.2 million with a bustling urban area of 10.4 mil) for the countryside. Wait until they hear the population of New York City is over 8 million, or that Los Angeles County (where I grew up) is 10 million! No denying it - everyone knows where Paris is, yet few know where the STATE of Colorado with it's 5 million people are located. This is the main reason why I always try to include maps when I describe a cycling route or race. The first thing I want to know is WHERE IS IT. Seems I spend much of my life looking for things. Pedal Dancer® has an international readership, so I never assume someone knows a location, because I have learned - dinner guests in France do not know where Colorado is located and it took me years to locate Mont Ventoux. Still I laugh at myself trying to simplify maps down to the basics. 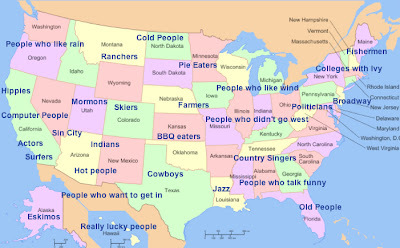 What if I were talking about the United States, how would I map out America to explain regions to a visitor? 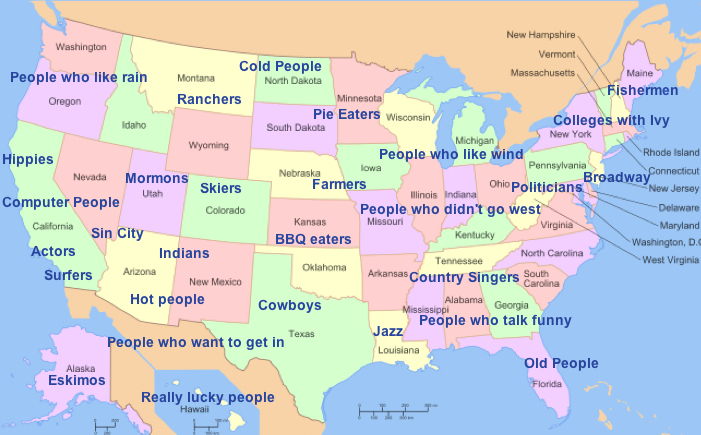 Do you think this map would help people decide where to visit America? Or am I over-simplifying things? My only other tip would be to NEVER take a Greyhound bus across this big country. And Las Vegas is a really weird place.